Nat Harris, left, and Leo Pollock, co-founders of The Compost Plant, were on hand at the Sept. 20 festival with an army of compost bins. PROVIDENCE — The more than 1,000 people who converged on the city's waterfront Sept. 20 for the inaugural Ocean State Oyster Festival were probably so focused on slurping down briny bivalves that they may not have paid much heed to the yellow compost bins at the dozen or so waste stations scattered throughout the festival venue. That is, until they went to discard their compostable trays and oyster shells. Student volunteers from Brown University, Johnson & Wales and Providence Country Day School were stationed at almost every bin to instruct attendees that their shells and trays should go in the yellow bins, not the trash. Andy Cutler, one of the festival's co-founders, said he did a lot of legwork during the planning stages to make sure the event was low waste. He credits Meggie Patton, academic and student engagement coordinator at Brown University, with providing much guidance and support. "She took the time to make me think about what was and wasn't doable," Cutler said. For example, instead of plastic or disposable plates, attendees were issued compostable egg-carton trays in which to put their oysters. Recycling bins were available for plastic beer cups, and there was no plastic cutlery. Attendees were issued compostable egg-carton trays in which to carry their oysters. "There are events that care about the environment and events that don't. It's a little more work to care, but the result of that caring has a huge impact on the environment," Cutler said. The festival contracted with The Compost Plant, a commercial food-scrap collection service, to manage the compostables. Leo Pollock, co-founder of The Compost Plant, estimated that roughly 1,600 gallons — totaling nearly 2.5 tons — of compostable material was diverted from the trash. He noted that because there were event volunteers on hand showing people where to throw their waste, his staff saw very little contamination (i.e. trash) in the compost bins. "These are the kind of events that showcase what's possible with 'closing the loop' in the food system," Pollock wrote in an e-mail to ecoRI News after the festival. "It was a celebration of local oyster farmers and the amazing oysters produced in Rhode Island, and the compostable waste from this event will be turned back into high-quality compost, which next year will be helping land-based gardeners and farmers in Rhode Island grow more local food." 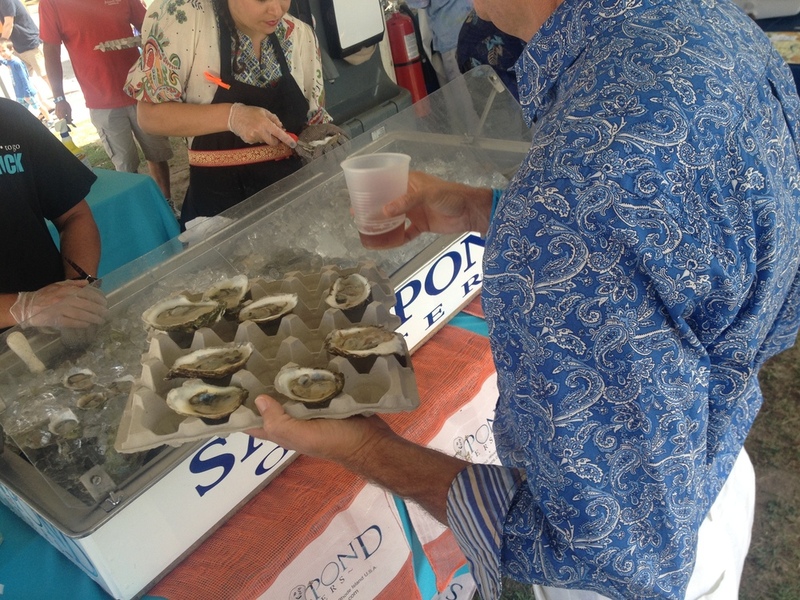 Editor's note: ecoRI News was a media sponsor of the Ocean State Oyster Festival.